The goal of cosmetic dentistry is to improve the appearance of teeth that show when you smile and talk. If you have ever felt self-conscious about your smile, you owe it to yourself to request a consultation with our Kalamazoo, MI cosmetic dentist. 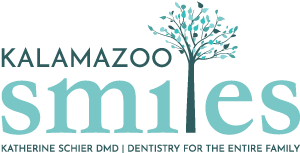 During your consultation, we’ll be able to discuss ways we can improve teeth in the “smile zone.” Click the links below to explore our cosmetic dentistry services or call Kalamazoo Smiles at (269) 353-3700. Our Kalamazoo, MI cosmetic dentist may recommend porcelain veneers to cover teeth that are slightly chipped, cracked, discolored, or have other minor imperfections. Whether you chipped a front tooth or need to cover a stained tooth, you can trust our veneers dentist to find the right solution for your smile. Dental veneers can help you smile with confidence and maintain good oral health. If you’ve ever felt self-conscious about discolored or stained teeth, it’s time to request a consultation with our Kalamazoo, MI teeth whitening dentist. We offer Zoom teeth whitening in our office to help patients smile with confidence. To learn if you’re a candidate for Zoom whitening, request an appointment with our teeth whitening dentist. A dental implant is an artificial tooth root (typically made of titanium) we place in your jawbone to later anchor a crown. If you’ve recently lost a tooth, your first call should be to our Kalamazoo, MI dental implant dentist. Our dentist will be able to determine whether you’re a candidate for the dental implant procedure. Our dental implant dentist has plenty of experience helping patients just like you smile with confidence after tooth loss.